The table saw is one of the most traditional of all cutting tools. They are used primarily in the home and in some woodworking shops. A type of woodworking tool that consists of a circular saw blade mounted on an arbor. The electric motor is directed by gears or belt. Its blade extends above the surface of the table in order to provide support for the materials that are to be cut. The first circular saw was created around the 16th or 17th century, and in 1777, the first patent for a table saw was given to Samuel Miller. Table saws have become the heart of wood shops. They are capable of performing a variety of tasks to include rip cuts, dado cuts, mitering, and cross cuts. In the early days of the table saw, the saw’s blade and the arbors were fixed. In order to vary the depth of the cuts, the table had to be moved manually up and down, exposing part of the blade. Cutting angles was just as difficult since the table had to be held at an awkward position in order to achieve the angle cut desired. Achieving various depths of cut in a table saw today is easier and achieved simply by moving the blade up and down. Miter cutting is made easier by adjusting the saw blade and not the table. Modern table saws are more durable and capable of a more accurate cut. 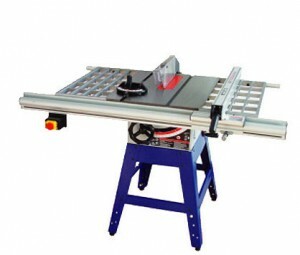 Depending on the cutting operation, there are several varieties of table saw to choose from: the contractor, portable, cabinet (stationary), and the hybrid table saw. A common problem encountered during a table saw cutting operation is kick-back. This usually occurs when the saw blade catches the work piece, throwing the blade to the front of the saw where the operator is usually standing. For safety purposes, a table saw operator should never stand directly in line with the blade and fence when performing any cutting procedure. Ideally, the blade of the table saw should extend about a quarter of an inch (7.5 mm) higher than the board being cut. Doing this will help to lessens the risk of kick back, avoid any injuries, and also enable a smoother cutting effort. The table saw is not just a machine for cutting materials and is a worthwhile investment for any machine shop. 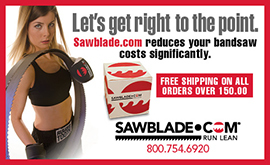 This entry was posted in All Posts and tagged #bandsaws, #SawBlades, bandsaw blade, bandsaw machines, blades, machinists, Saw Blade, sawblade.com, Table Saw, woodworkers. Bookmark the permalink.